Security roller shutters in a dead mall. A roller shutter, coiling door, roller door or sectional overhead door is a type of door or window shutter consisting of many horizontal slats (or sometimes bars or web systems) hinged together. The door is raised to open it and lowered to close it. On large doors, the action may be motorized. It provides protection against wind, rain, fire and theft. 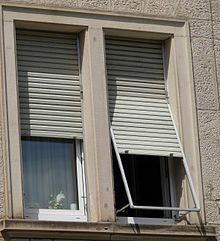 In shutter form, it is used in front of a window and protects the window from vandalism and burglary attempts. Roller shutters have many applications including doors for vans, garages, kitchens, schools, prisons and warehouses. In some parts of the world, roller shutters are subsidized by local governments. In areas that are frequently exposed to inclement weather, roller shutters are used as a method of insulation, can protect windows against hail damage, and can be made to withstand high wind. Spring assist roller shutters are operated by manually lowering or lifting the handle which is mounted to the curtain end slat. Most cost effective solutions for securing small spaces. With a tubular motor fitted within the roller axle tube. Automatic operation can be added. Controlled with a smartphone, remote or hardwired switch. Extruded or roll formed steel, aluminium or stainless steel. Single or multi wall. Hollow or insulated designs. Steel, aluminium tube supported at either end by an end plate. Formed steel or aluminium extrusion box designed to protect shutter’s internal components. Spring wire. Made from the spring wire, it also called torsion spring. Flat spring. Formed by hardened and tempered steel strips in coils. Common steel grades C67, CK67, SAE1070, etc. Steel or aluminium to retain the shutter curtain within the opening. Weather sealed to increase product lifetime and reduce operating vibration. Steel, aluminium or PVC to match the rest of the roller shutter curtain. Safety edge or rubber weather seal to reduce draught can be added. Important part of roller shutter used to manually secure the curtain slats in place. Can be locked with slide lock and bullet lock. Slim key locks are installed within the end slat and have bars that securely lock shutter into the guide rails.